This event in January is sponsored by the City of Semmes at a location in Semmes to be announced . This event features an evening gathering complete with refreshments and a great movie to entertain both young and old alike. The first Camellia Festival was held in 1949. when local nurserymen and flower growers showed their prize camellias in exhibits and elected from Semmes High School, several articulate and poised young ladies to represent Semmes as Camellia Maids. 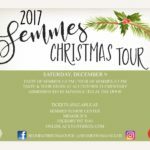 The Maids were charged throughout the year with representing the City of Semmes, promoting the area’s activities and sharing the town’s history with visitors. In 2013, the Semmes Camellia Festival experienced a revival supported by the Friends and Alumni of Semmes School. This Camellia Festival Revival, holding with the tradition established 60 years ago includes a selection of Camellia Maids and a show featuring the beautiful state flower, the camellia on display by local growers and citizens. Hosted at the Semmes First Baptist Church, 4070 Wulff Road each January, residents can browse the many brilliant camellia displays, attend an educational lecture, view growing demonstrations and purchase camellias for sale. Children’s play area with carnival style rides and games. Plant Sale- Sponsored by the MGM Football Booster/Horticulture Club. Beautiful azaleas and other shrubs on display for sale. Food Vendors- Ice cream, barbeque, funnel cakes, hot dogs, hamburgers, and much more. Fun for the kid in all of us! Bounce houses, food/local vendors, games and prizes are just some of the fun on hand in Semmes Municipal Park in this event scheduled each spring. Spring has Sprung! Enjoy an evening out hosted by the City of Semmes with your family. The place and the movie will be announced in advance of the event. Popcorn, candy, and drinks will be served. “Clean up our corner of the Earth Day” We invite citizens to form and bring their own teams to this event. Each team will be assigned an area in our city to clean up. Participants will receive t-shirts and the satisfaction of joining together to celebrate this day celebrated around the globe! This event at Honor Park is hosted each year in May by the City of Semmes and local clergy from various churches in the Semmes area. These local clergy of different denominations offer prayers for our everyone not just in our City, but throughout the world. You are invited to join your City officials and your neighbors for coffee and doughnuts in the park on this day of prayer celebration. The City of Semmes celebrates Arbor Day in conjunction with the annual Heritage Day celebration at Heritage Park in May. Free Arbor day trees are given away by the City of Semmes at this celebration. The annual Heritage Day celebration, sponsored by the Friends and Alumni of Semmes School, celebrates the history of the Semmes Community, it’s culture, and way of life from days past. The event is free and open to the public. The celebration features music, dancing, and tours of the one-room school house, log cabin, and Malone Chapel. There are demonstrations of activities from past eras in our community featuring skilled artisans demonstrating their crafts, such as wood-carving, soap-making, loom weaving, basket making, blacksmithing, and a corn grinding demonstration in a hand grist mill. Other activities and exhibits include an arts and crafts show, carriage rides, and appearances by the Semmes Camellia Maids. Lunches are provided for sale for a nominal fee and all proceeds benefit Heritage Park. Memorial Day is a federal holiday in the United States for remembering those who died while serving in the country’s armed forces. The holiday is observed every year on the last Monday of May. Memorial Day is not to be confused with Veterans Day. Memorial Day is a day of remembering the men and women who died while serving in the military forces, while Veterans Day celebrates the service of all U.S. military veterans. Memorial Day, originally called Decoration Day started as a day of remembrance to honor those lost during the Civil War. The Civil War, which ended in the spring of 1865, claimed more lives than any conflict in U.S. history and required the establishment of the country’s first national cemeteries. Under the leadership of women after the Civil war, an increasingly formal practice of decorating graves took shape in the U.S. After World War I the holiday evolved to commemorate American military personnel who died in all wars. On Memorial Day, the flag of the United States is raised to the top of the staff and then solemnly lowered to the half-staff position, where it remains only until noon. It is then raised to full-staff for the remainder of the day. Each year on Memorial Day a national moment of remembrance takes place at 3:00 p.m. local time. Each year on Memorial Day, The City of Semmes and it’s citizens honor those who have died in U.S. wars in a remembrance ceremony at the Honor Park in Semmes. Kids Zone – Multiple activities for the kids to include carnival rides, face-painting, games, and inflatables to play on. Other entertainment includes a petting zoo and puppet shows. Car Show – There’s something for every car enthusiast, from antique automobiles to new hot rods. Craft Show – Local vendors display their crafts for sale from clothes to household decorations and everything in between. Food – There are a variety of food stations throughout the event as well as the concession stand located inside MGMstadium. There is always an assortment of food and drink available. Musical Entertainment – To be announced each year. Previous Freedom Fests have featured such groups as The Martins and Finding Favour. Additional Details: There is ample parking inside MGM, however there is more parking at Semmes Ballpark. No ice chests, firearms, alcohol, pets or personal fireworks are allowed at this event. The event starts at 4:00 p.m. and the cost to attend will be announced annually. This event which began in 2007, continues to grow in attendance each year. The Orchard Assembly of God organizers and their community partners envisioned this event as a family-friendly event for the community designed to provide a place for everyone to celebrate what Americans hold dear to their hearts, “faith, family. and friends”. For further details you can visit the Semmes Freedom Celebration facebook page. Want a great way to chill out in July? How about a great movie to enjoy inside out of the heat. Join the City of Semmes for our summer movie night with popcorn, candy, and drinks…. all on us. The location and the film will be announced in advance of the date. National Night Out in August was introduced in August of 1984 by the National Association of Town Watch. It was launched through an already established network of law enforcement agencies, neighborhood watch groups, civic groups, state and regional crime prevention associations and volunteers across the nation. The first annual National Night Out in 1984 involved 2.5 million neighbors across 400 communities in 23 states. The event soon grew to a celebration beyond front porch vigils. Neighborhoods across the nation began to host block parties, festivals, parades, cookouts, and other community events with safety demonstrations by local fire departments, seminars, youth events, exhibits, and much more. Today, it is estimated that thirty-eight million neighbors in sixteen thousand communities across the U.S participate in National Night Out celebrations. The City of Semmes is among these communities. Each year, your City Government invites the citizens of Semmes to come out and meet our first responders from the Fire and Rescue department and local law enforcement representatives for a night of community fun, education and safety/crime prevention demonstrations. Local vendors also will be on hand to display and sell their wares. Hosted by City Hall, refreshments to include hot dogs and ice cream are provided along with entertainment and activities for the kids such as bounce houses and water slides. “Sparky” will be on hand to greet the kids and take-away goodie bags are also distributed at the end of the evening. So join your Mayor, Council members, and neighbors for a night of community celebration and safety education. Beginning in 1979, National POW/MIA Recognition Day legislation was introduced annually to honor those returned and those still missing and unaccounted for from our nation’s wars. The third Friday in September has been designated as a day to recognize and honor these members of our armed forces. Ceremonies are held annually on National POW/MIA Recognition Day in our Nation’s capital and throughout the nation at military installations, ships at sea, state capitols, and municipalities. In our Nation’s capital, flights of high performance military aircraft are conducted in Missing Man formations to honor these individuals. In the City of Semmes, the POW/MIA flag is flown in Honor Park to focus attention and to ensure along with the rest of the nation that America remembers its responsibility to stand behind those who serve our Nation and do everything possible to account for those who do not return. This remembrance ceremony is hosted by the City of Semmes. The Mobile Pops is celebrating its 40th season this year. If you enjoy or are moved by live performances of symphonic music, then you will definitely want to attend this event. The Mobile Symphonic Pops Band was formed in 1977 and is a voluntary community band. It is made up of adult, volunteer woodwind, brass, and percussion players. The band is currently led by Conductor David Dueitt. Dueitt is a retired band teacher and Director with more than 30 years of experience working with music education programs. In the past few decades, the band has gained in prominence and popularity. The band has been called to play at events outside the area, such as the Louisiana World Exposition in New Orleans. Join your community for an elegant evening of symphonic music. Further details will be provided in advance of the concert on the City of Semmes facebook page. A new school year has begun with homework and busy schedules to meet. Take a moment to enjoy a night out with your family! Sponsored by the City of Semmes with popcorn, drinks, and treats for all. The location and film will announced in advance of the date. Veterans Day is an official United States public holiday, observed each year on November 11th. This day honors military veterans who served in the United States Armed Forces. It coincides with other holidays, including Armistice Day and Remembrance Day, celebrated in other countries at the end of World War I. Major hostilities of World War I were formally ended at the 11th hour of the 11th day of the 11th month of 1918, when the Armistice with Germany went into effect. This U.S holiday was renamed Veterans Day in 1954. Veterans Day celebrates the service of all U.S. military veterans. It is not to be confused with Armed Forces Day , which occurs in May, which specifically honors those currently serving in the U.S. military. A citizen of Alabama and veteran of World War II, Raymond Weeks from Birmingham, had the idea to expand Armistice Day to celebrate all veterans, not just those who served in World War I. Weeks lobbied President Dwight Eisenhower, who supported the idea of National Veterans Day. Weeks led the first National Celebration in 1947 in Alabama and annually until his death in 1985. President Ronald Reagan honored this Alabama military veteran with the Presidential Citizenship Medal in 1982 as the driving force for the national holiday and considered him the “Father of Veterans Day’. Join your neighbors in Honor Park along with City of Semmes municipal officials to celebrate and honor the military service of fellow Alabamians and all veterans who have served our country so proudly. The City of Semmes celebrates the beginning of the Christmas season in Semmes with the lighting of the Christmas Tree ceremony held outside the library. Citizens are invited to join our city leaders for a night of music and yuletide celebration. Santa will be on hand to thrill the kids and refreshments of hot chocolate and cookies will be served. A festive holiday celebration is hosted each year by the Friends and Alumni of Semmes School at Heritage Park. The evening’s festivities begin with a Christmas program held in the Malone Chapel. At the completion of the Christmas program, friends and guests walk next door to the One-room Schoolhouse for cookies and wassail served by the light of kerosene lamps. Musical entertainment is provided by local musicians or choirs. The annual Christmas parade hosted by the City of Semmes rolls through the streets of Semmes with floats sponsored from local businesses, churches, and community organizations. Marching bands, antique cars, riders on horseback and dance troupes accompany the floats. The parade is led by a new Grand Marshall each year and of course Santa also pays a visit atop a float. The throws for the kids include beads, candy, toys, and stuffed animals. Join your neighbors on the streets of Semmes for this fun filled seasonal event. The parade route will be advertised in advance. This yearly event is sponsored by the Semmes Woman’s Club in partnership with the City of Semmes and Mobile County Commissioner Connie Hudson. The proceeds from the tour benefits historic preservation in Semmes. Local homes, historic landmarks, and decorated parks are featured on the tours. Local businesses and restaurants also contribute to this celebration. The Tasting Tour usually begins at Allentown Elementary School, where the entire Christmas tour begins. The Tasting Tour is catered by local restaurants and caterers who provide generous samples of their fares. The Tasting Tour usually lasts around two hours and guests will received the tour map with the home’s addresses and directions listed at The Tasting Tour. Homes that are featured on the tour reflect the owner’s tastes and their personal styles in choice of Christmas décor. Some are decorated in traditional styles, others reflect whimsical, elegant Victorian, or southern touches. Historic stops on the tour include usually include Heritage Park and the Blackwell Estate which houses the Semmes Senior Center. Tickets for this event will be available in advance and information will be available on the Semmes Woman’s Club Facebook page. Annual event updates can be found on the City of Semmes facebook page. View our Christmas Parade highlight here. Enjoy https://www.facebook.com/forhimfilms/videos/1820802354636799/. Volunteers Needed to Help clean up the community on April 7th starting at 7:00 am… see the attached flyer for more details.